Jumpin' From 6 to 6 - the webzine that rocks! From now on, the latest reviews, updates, articles and interviews will be available on the Rockabilly Chronicle. Ricky Lee Brawn (Stargazers, Big Six, Space Cadets...) has a new band named The Shooting Stars (he previously used that name to back Marshall Lytle of the Comets in the 90's) gathering an all star lineup with Steve Pulford, Helen Ingham, Darren Lince, Phil Morgan and Darren Richards. They have a 3 tracks 10" out on Rhythm Rock It (Anders Janes/Clark Kent label) Buy it here (limited to 500 ex.) ///// The Piccadilly Bullfrogs have a new mini album out on On The Hill records that coincides with their Japan tour. Don't wait to buy it, it's a limited edition ///// The new Stargazers single - their first recording studio with Peter in nearly 20 years - is in the the can. Expect a release soon ///// Another legend died: RIP Phil Everly ///// The Rockats ended the year in the studio to record tracks for their forthcoming album still on Lanark ///// Also on Lanark there'll be a brand new album from Robert Gordon soon ///// Clint Bradley (Blue Cats) has finished the recording of a solo album of western songs to be released later this year on Bluelight Records ///// Bluelight also plans to release a Restless album later in the year ///// Jackson Sloan (Rent Party, Oo Bop Sh'Bam) have a new album out titled "the Shack Sessions" and it's brilliant. Review to come soon ///// Psychobilly legends The Ricochets have a new album out on Diablo Records titled Chain Dog ///// Kieron McDonald's third album "Hair of the Dog" is now out on Press Tone ///// Morrissey's third solo album, Your Arsenal, the first to feature Boz Boorer (Polecats), Gary Day (Frantic Flintstones, the Nitros, the Sharks), Alain Whyte and Spencer Cobrin (both in Born Bad / The Memphis Sinners) will be re-released in February with a live DVD ///// Sad news to begin with: we've lost Mac Curtis and Marvin Rainwater ///// Brian Setzer is in Nashville to record a brand new Rockabilly album with Mark Winchester (double bass), Daniel Glass (drums) and Kevin Mc Kendree (piano). ///// Lee Rocker is heading back into the Studio to record a new album of all original music. It should be released in February 2014. ///// 'On A Live Mission' is the name of the first Blue Cats live album released on CD, DVD and limited double-LP on November 1st 2013. Pre-order it on raucous ///// The Black Kat Boppers, with Roy Phillips (ex-Get Smart) on vocals will release their debut album this month on Foot Tapping Records. It features 12 original songs and a special guest appearance by Paul Simonon (the Clash). ///// Colbert Hamilton & the Nitros (John O'Malley: guitar, Jason King: bass, Guy Schalom: drums) have a new album out. titled "Love or glory man". More infos here ///// Craig Maki (Big Barn Combo, Bones Maki and the Sundodgers) will see his book "Detroit Country Music Mountaineers, Cowboys, and Rockabillies" released on October 28th by the University of Michigan Press. More infos here ///// In the making is a book about the late Ray Condo. The author is currently raising funds via Indiegogo. You can help this project here. ///// Charlie Thompson has a new 10" Vinyl out now on Vic-Tone records ///// The Lucky Stars are putting the final touch to their third album scheduled to be released this fall. It is called "The Lucky Stars Go To Town" and will contain 13 songs (all originals!). They are also scheduled to appear at the High Rockabilly Festival in September. ///// Talking about the Lucky Stars, their Hawaiian side-project, The Hukilau Hotshots, featuring Dave Stuckey, Sage Guyton on ukuleles, Wally Hersom on bass and Rusty Blake on steel have just released a single (check http://www.cdbaby.com/Artist/TheHukilauHotshots for more infos). ///// Nikki Hill recently collaborated with Deke Dickerson and the Bo-Keys ///// Brian Setzer executive produces Drake Bell's album (if you don't know who is Drake Bell, welcome to the club) ///// Pokey Lafarge has a new album out ///// This Fall, Yep Roc will release Mondo Zombie Boogaloo, an album celebrating Halloween. It’s a collection of new music from legendary bands The Fleshtones, Southern Culture on the Skids, and Los Straitjackets ///// Daw Shipley has a new single out ///// Rusty Pinto's latest album is one of the best thing I've heard this year. Superb rockin' blues/rhythm'n'blues with a bit of rockabilly and Pat Capocci on guitar ///// The Blue Cats will be releasing on Bluelight records a live DVD and album recorded in Helsinki on the 25 May this year. Release date to be announced soon ///// The B-Stars shot a video for their song Still Waitin from their latest album ///// Big Sandy and his Fly-Rite Boys have a new album on Cow Island Music called "What a Dream It's Been" celebrating their 25th anniversary. It features re-arranged and re-recorded all new acoustic versions of songs from their back catalog. ///// Now available: Stray Cats - Ultimate Rarities featuring rare and unreleased stuff (demo, outtakes and Setzer first recording circa 1977). ///// The Reverend Horton Heat is working on a new album titled “REVolution”, and the Rev’ promises a return to a harder sound more in the vein of the band’s earlier albums. Big news for Big Sandy and his Fly-Rite Boys who have just signed a record deal with Cow Island Music! Look for Big Sandy 's new all-acoustic release "What A Dream It's Been" to hit the streets this summer ///// The Blue Cats plan to record a gig for a possible live album and DVD ///// Brian Setzer has finished writing 20 new songs ///// Kim Lenz's fourth album entitled "Follow Me" to be released in July ///// Mark harman (Restless, Space Cadets) and his new combo the Hot Rod Rhythm Boys have finished the recording of their second album. Expect it for the end of the year ///// "Uncovered in Studio 1" is the newest Caravans album ///// Cousin Harley (aka Paul Pigat) released his first all instrumental album B'hini Bop ///// Neo-rockabilly legends the Rockats are back with a brand new album on Lanack Records called "Rockin' Together". Liner notes by Brian Setzer ///// The Tall Boys are putting the final touch to their brand new album ///// Talkin' about legends, the Stargazers were in the studio this month to begin the recording of their first album in nearly 20 years ///// Beside drumming for Los Straitjackets and Deke Dickerson and fronting his own truckin' country band the 18 Wheelers Chris Sprague found time to lead his own 60's rock'n'roll combo the Outta Sites. Their debut album "Shake All Night" is available now on 12" vinyl and cd ///// You can now pre-prder Alan Wilson's book "The Western Star records story - the first decade" ///// Jack Baymoore and the Bandits are back with a brand new album on Atenzia records called "Let's Drag". It sounds very good. If you haven't heard of Nikki Hill, you're missing something friends. Imagine Etta James, Little Richard and Barbara Lynn all rolled into one. Not bad, isn't it? For she moment she only has one Ep out but plan to release an album soon. James Hunter, who was also known as Howlin Wilf back in the days, will release a brand new album very soon. If you dig Sam Cooke and that kind of stuff, jump on it. More info here. This is not very recent but the Slingshots from Sheffield have released a brand new album called Misfits and it's excellent. Grab a copy on their website. Labels owners, your attention please! The Frantic Vermin have finished recording their debut album and are looking for a label. If you dig Psychobilly with an "old school" twist (I mean they aren't a metal band with a double bass) this guys are for you. 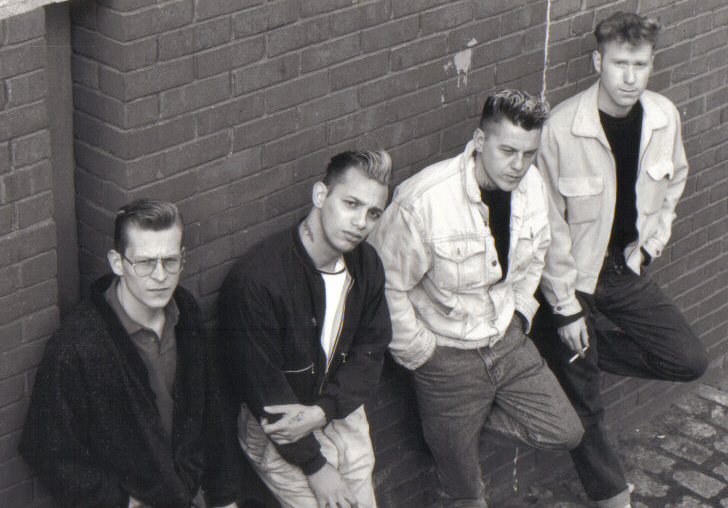 They're not totally newcomers, having started under the name of the Alleycats in 1982 as a rockabilly band then morphed into the Frantic Vermin in 1986 (and appeared on Cool Cat Go Ape on Big Shot Records) before disbanding around 1988. They recently reformed and are as tight as ever. I'll go more in depth about this band soon but in the meantime check their website or their facebook and go to soundcloud to listen to clips from the forthcoming album. and also four new singles (Keith Turner & The Southern Sound, The FretTones, Andy Wren and Adam Burney). The first 100 copies of each release comes on coloured wax in a numbered poly bag with a picture insert. I was terribly sad to hear of the passing of Nick Curran. Nick was only 35 years old, which is way too young to die. He was fighting a cancer for a couple of years. Though I never met him in person and he certainly never heard of me, music has this power to make you feel close to certain persons and I can say that I felt close to Nick in a certain manner (the same way I felt close to Ray Condo or Lux Interior). He was immensely talented he will be sorely missed. My sincere condolences to his family and friends. Wherever you are, choose your favorite Nick's album and give it a spin (and play it loud!). If you dig the Memphis soul sound, check out the Bo-Keys. They have a few excellent albums under their belt. They recently backed Deke Dickerson for a 7" that oozes class and country soul and also released one with Percy Wiggins (Electraphonic recordings). The Rechords from Australia have a new ep out. Featuring drums, it shows a slight change of direction in the sound of the band. The Meteors' latest studio album "Doin' the Lord's Work" has just been released on People Like You records. There's also a new Legendary Raw Deal ep out on Mutant Rock records. Psychobillies, your attention please! Trophy records (a division of Western Star) will release in November a five cd boxset in its Klub Foot serie including recordings by Frenzy,Skitzo,Get Smart,The Rapids,Wigsville Spliffs,Torment,Get Smart,The Caravans, Restless,The Tall Boys,Rochee & The Sarnos, The Pharaohs,The Coffin Nails and more. Available for pre-order now here. To coincide with their European tour, Pokey Lafarge and the South City Three will release a live album this October. Hank Maninger would be Stompy Jones' new singer. San Francisco based honky tonk/hillbilly swing band the B-Stars have seen some line-up changes since their debut album, but the newly released "West Coast Special" is another solid one. Buy it at cdbaby. It arrived. The brand new Brian Setzer live album is a killer! Lee Rocker has released a brand new digital only EP called "Cat Tracks". You guessed it, it's made of covers of the Stray Cats. He will also release a serie of live album titled Hot'n'Greasy, starting September 4. Gina Haley, daughter of Bill Haley, has released an album with Phil Haley and the Comments on Press Tone records International. The triple vinyl version with bonus tracks (Stray Cat Strut, Rock This Town) is available for pre-order. 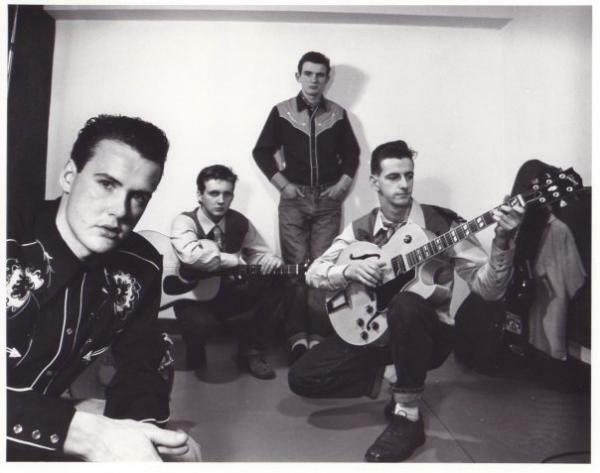 Crazy Cavan and the Rhythm Rockers' new album "Rollin and Rockin'" is now out. Order it here. Be sure to grab a copy of Big Sandy and the Fly Rite Trio / the Bellfuries live at the 15 th Rockabilly Rave on DVD. 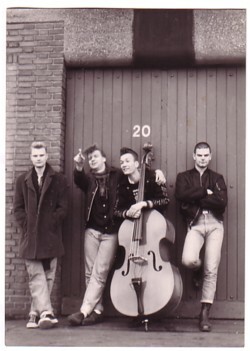 Roy Rapid and the Rhythm Rock Trio are an excellent young rockabilly band. They've just released their debut album. Check 'em out here. Also worth checking are the Millwinders. It's not that recent, but after a nearly 10 year hiatus, Tom Armstrong has released a brand new album. My copy of the Zazou Cowboys debut album arrived yesterday. Holy cow! This is amazing. Not only the package and the design are beautiful (a beautiful heavyweight 180gm 33rpm record and a matching CD containing all the same songs in a deluxe gatefold package with inner-mounted CD, limited to 1000 copies worldwide),but the music is even better. If you dig Bob Wills, le Quintet du Hot Club de France, the Hot Club of Cowtown, Gene Autry and the Sons of the Pioneers this one is for you. Rockabilly, Psychobilly, Neo-Rockabilly, Blues, Swing, Jump, Surf, Garage, Western Swing, Hillbilly Boogie, Jazz... That's the music we dig here at Jumpin' From 6 to 6! We founded this webzine to share our love for all this genres. Since 2005, with a non-stop pleasure, we interview, review and hopefully make you discover new artists and records. And you know what? We are not decided to stop! The Razorbacks - Go to Town! The Headcoat Sect - Ready Sect Go! Be a part of domething big! With the rockin' database, we want to built an encyclopedia of rockin' music from the 70's til today. WE WANT YOU FOR THE ROCKIN' DATABASE!